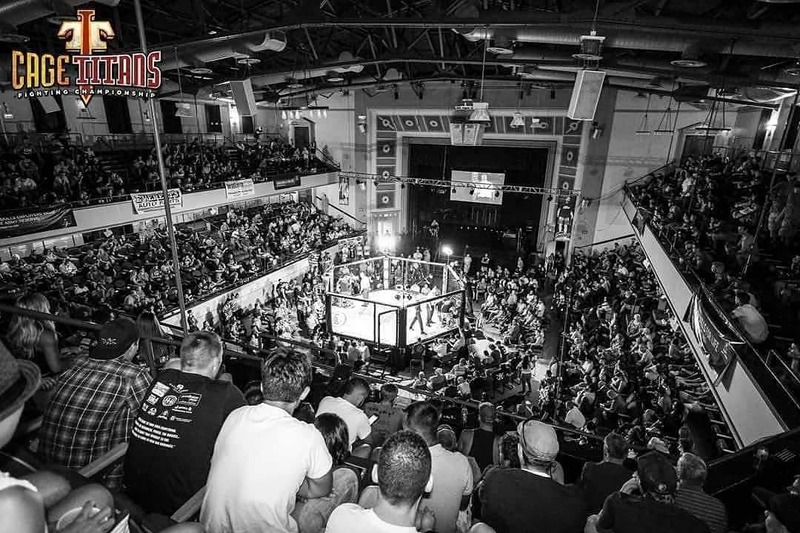 Plymouth, Massachusetts - Plymouth Memorial Hall opens its doors once again to New England fight fans as Cage Titans 43 is set to go down Saturday April 6th from Plymouth Rock! As we have become accustomed to, Cage Titans rolls out a stacked card full of talent, intrigue and story lines With no storyline being more prevalent then a so called “Dawn of a New Era,” Cage Titans once again turns its roster over, as three, now former, Cage Titans Amateur Champions are set to make their professional debuts. Amateur Flyweight Champion; “Killa” Mitch Raposo (6-0 as Amateur), who never lost a round, let alone a fight, punches his professional ticket against Colorado’s Rob Fuller (0-3). “International Man of Mystery” and Amateur Bantamweight Champion Jacobo Apito (4-2-1 as Amateur) takes his talents to the professional ranks against New York’s Michael “Titan” Taylor (1-2). Standing six feet seven inches tall Amateur Welterweight Champion Trevor “Scarecrow” Gudde (6-0 as Amateur) has proved to be a tall task for anyone in the 170 pound division, he takes his lengthy frame to the professional ranks against Vermont’s Johnny “The Wild Child” Adams (0-3). Cage Titans 43 will also return three of the promotions most successful professionals all looking to bounce back off the first losses of their young careers. Grappling guru Danielle “The Dark Horse” Hindley (3-1) fell victim to her own craft at Cage Titans 41 suffering her first professional loss to Alyssa Krahn (5-2) by second round submission, she looks to bounce back against last minute replacement Brianna Smith (0-4). Straight Blast Gym’s Jeff Perez (4-1) suffered his first career defeat by judges decision at Cage Titans 42 against fellow grappler Shane Manley (5-5), Perez attempts to get back to his winning ways against Ohio’s Raymond Yanez (4-12). Finally it was a battle of two top Lightweight prospects when fan favorite Zach DiSabatino (5-1) locked horns with Michigan’s Darius Estell (5-1) at Cage Titans 42, as DiSabatino suffered his first loss in a narrow Split-Decision. The Evening culminates in fashion with four of Cage Titans most experienced veterans set to return to the cage as Light- Heavyweight grappler Jesse McElligott (6-3) matches wits with New Hampshire’s Ron Marshall (0-1). Don “Shameless” Shainis (4-2) ends a year long layoff due to injury and looks to continue his climb up the Cage Titans Featherweight ranks against David McClendon (0-1). In the Co-Main event there is somewhat of a score to settle as Jimmy “The Tooth” Manning (5-1) looks to prove that his technical submission (due to injury) of Fernando Perez (7-16) at Cage Titans 35 was no fluke as these Lightweights are ready to run this one back! And in the Main Event, Cage Titans Middleweight king Sean “The Unpredictable One” Lally returns home to the Cage Titans cage following the first back-to-back losses of his career against two of the toughest Welterweights one could imagine running into; Christopher Curtis (20-5) and Kemran Lachinov (8-2). Lally hopes some good home cooking will help him get back to his winning ways against the Northeast MMA veteran; Shedrick “Chocolate Thunder” Goodridge (6-10) in the Middleweight grand finale! Below is a look at the full 15 fight card, in what should be the order it will unfold from the historic Plymouth Memorial Hall in Plymouth, Massachusetts, with first bell due to sound at 6 pm local time. Event will be streamed live on flocombat.com. For ticket information visit CageTitansFC.com. Breakdown: Tri-Force MMA’s Dion Rubio cemented his spot as the number one contender in the Amateur Lightweight division with a first round guillotine of James Squire at Cage Titans 41. With current Cage Titans Amateur Lightweight Champion; Matt Beina taking some time away from competition following his loss to Eddy George at Reality in January, this matchup was a no brainer as Rubio and George throw down for the Vacant Lightweight strap. Breakdown: Featherweight Shane Dougherty earned some serious stripes in an all out war against Brett Layton at Cage Titans 39 at Pinz, following that performance Dougherty picked up another decisions victory over Sean Murrin at Cage Titans 41. With three straight wins to open his MMA career Dougherty was a lock for a shot at the Cage Titans Featherweight title, he will get that shot Saturday night as he welcomes South Carolina’s Jordan Brown back to the Cage Titans cage for the third time in his career, and this time there is a belt on the line. Breakdown: Fall River’s Raposo made Amateur MMA look easy, knocking down every man that stood across from him over six fights, winning all six by decision without ever losing a round. The 20 year old Raposo retires his Cage Titans Flyweight title, something he was originally supposed to do at Cage Titans 42 in January against Matt Lyall, Saturday night as he welcomes the always game Rob Fuller back to Plymouth Memorial Hall. Fuller will be fighting with a heavy heart as his 18 year old cousin Miles Mitchell, was shot and killed Sunday in Fuller’s home state of Texas. Breakdown: With back to back decision victories to capture both the Cage Titans Amateur Flyweight belt, as well as the Cage Titans Amateur Bantamweight belt; Citadel Martial Arts’ Jacobo Apito is coming into his professional showcase, battle tested. Jacobo gets quite possibly the toughest task of all three Cage Titans former Amateur Champions turning pro at Cage Titans 43. Apoto welcomes former three time CES MMA combatant, New Yorker Michael Taylor, to the Cage Titans cage for the first time. Breakdown: The six foot seven inch Trevor “Scarecrow” Gudde proved over his two year Amateur career, where he stacked up six win against no losses, that his lengthy frame is going to pose a problem to just about anyone at 170 pounds. After big wins over also highly touted Amateurs Marty Navis and Neil Von Flatern it was evident that it was Gudde’s time to turn pro. Gudde will do just that Saturday night against Vermont’s Johnny “The Wild Child” Adams. Adams has been fed to the wolves in his tenure on the New England circuit suffering first round knockouts by both John Gotti III and Zach DiSabatino leading up to this fight with Gudde. Breakdown: Roxbury’s Jesse McElligott ended an over three year layoff from competition last November at Combat Zone 68, notching a decisive decision victory over New England pioneer Ray Shawdee. McElligott is a skilled grappler who has been tested in the cage by some of the best Middleweights and Light Heavyweights in the region, with better than average success. Jesse finds himself in the Cage Titans cage for the first time Saturday night against Dover, New Hampshire’s Ron Marshall. Marshall is also no stranger to a test, having thrown down three times with Fabio Cherant as well as bouts with William Knight, Jideofor Ojukwu and Stephen Kimball on his resume. Marshall will need to harness all of that experience if he hopes to get by the grizzled veteran; McElligott. Breakdown: New England Strawweight super prospect Danielle “The Dark Horse” Hindley suffered the first hiccup of her professional career at Cage Titans 41 against Alyssa Krahn, but as any seasoned grappler learns over time; some days you’re the predator and some days you're the prey. Hindley will be looking to build on her prospect status Saturday night against last minute replacement Brianna Smith, after Hindley’s original opponent Ivana Coleman, pulled out just days before the fight. Smith will be stepping into the cage for the 20th time in her career and the fifth time as a professional as she looks to avenge her previous loss to Hindley, by first round Submission, at Cage Titans 35. Breakdown: Resident submission specialist Jeff Perez met is match at Cage Titans 42 as fellow grappler Shane Manley stayed one step ahead of Perez for the duration of their fight, handing Perez the first loss of his professional campaign. Perez will look to bounce back at Cage Titans 43 and show just how dangerous of a grappler he still is against Ohio’s Raymond Yanez. Yanez is no stranger to the New England scene as his last four fights have been fought in the regions cages, Yanez is 1-3 in those four fights, holding a big first round guillotine finish over Joe Reverdes at CES 40. Yanez will have his hands full when he meets Perez Saturday night in hopes of handing the hometown favorite his second straight upset. Breakdown: Cage Titans fan favorite Zach DiSabatino took a big step up in competition last time out as he went to war with Michigan’s Darius Estell at Cage Titans 42. Although defeated, DiSabatino showed tremendous heart in the bout with Estell, Zach was hurt badly in every round of the fight but continued to grind on and look for a finish. That Finish never came as Estell handed Zach his first professional loss ending his nine fight win streak to start his MMA career. DiSabatino draws; Albert Tulley out of New York who could not find any answers to Marty Navis’ wrestling and ground and pound in their fight at Cage Titans 42, leaving Tulley with his first professional loss as well. Both men will look to climb back into the win column when the cage door slams on their bout at Cage Titans 43. Breakdown: Easton’s Don Shainis was highly regarded as one of the next big things in the New England Featherweight division before suffering a neck injury that threatened his fighting career. Derailed by injury and a decision loss to Daniel Matos at Cage Titans 38 last April, Shameless took a year away from the game to concentrate on his health and training as he makes his much anticipated return Saturday night against David McClendon. McClendon is two years removed from his pro debut which saw him tap to a Jimmy Manning Rear Naked Choke in the first round at Cage Titans 32. The Energy will be high in this one, as Plymouth Memorial Hall awaits the much anticipated return of Shameless; Don Shainis. Breakdown: There is no question Fernando Perez feels like he has some unfinished business with Jimmy Manning to attend to, after an injury evoked a second round technical Submission win for Manning in their first contest at Cage Titans 35. Following the victory over Perez, Manning went on to challenge Dan Dubuque for the Cage Titans Lightweight Title, Dubuque knocked Manning out in the first round of the Cage Titans 38 main event, leaving Manning wondering what would be next. Perez however always felt he deserved another shot at Manning, being that their first bout ended in somewhat of a fluke, Perez will get that second shot at “The Tooth” Saturday night as they throw down again, in the Co-Main Event at Cage Titans 43! Breakdown: Boston’s Sean Lally is widely regarded as the best technical power puncher in New England’s Middleweight division, Lally piled up eight wins against just two losses before the Cage Titans Middleweight Champion tested himself against Christopher Curtis on the second season of Dana White’s Tuesday Night Contenders Series. Lallys hopes were crumbled by a body shot, followed by punches, as Curtis claimed the third round TKO victory. Lally followed that performance with a frustrating decision loss to the wrestling heavy Kemran Lachinov at Bellator 207, leaving Lally to question his professional fighting career. Lally is a big fan favorite here in New England, and wasn’t about to walk away from the sport before testing himself at least one more time here on home soil. Lally matches up with New England veteran, and good friend (of Lally’s) Shedrick Goodridge. In a somewhat strange series of events, Goodridge’s up and down career finds him locked inside the cage across from his good friend Sean Lally as these two veterans are set to clash in the Main Event of Saturday’s Cage Titans 43!